Located in beautiful Westport, Connecticut for over 50 years, Sam Sloat Coins is a true brick and click store. We maintain a full service, secure internet web site, an eBay presence with over 17,000 successful auction sales and a 1,200 square foot showroom, filled with a most diverse and eclectic inventory. You will find our representatives at most all major coin shows and conventions. Sam Sloat Coins, Inc is not just coins. In addition to US, World and Ancient coins, we handle paper money, bullion silver, gold and platinum, tokens and medals. We are also well known dealers in celebrity autographs, political campaign and advertising pinbacks, estate and diamond jewelry, sterling silver flatware and hollow ware. 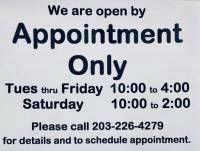 Located at 606 Post Road East in Westport, Connecticut we invite you to visit when in our area. Our store hours are 10:00 to 5:00 Monday through Friday, Saturday 10:00 to 3:00.